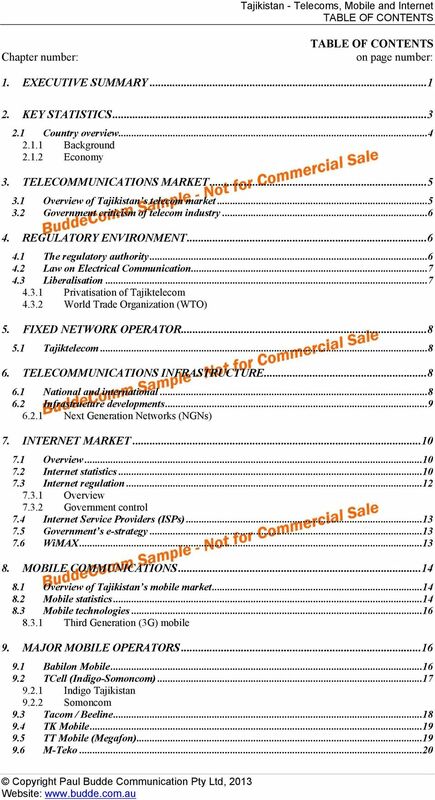 Download "TAJIKISTAN TELECOMS, MOBILE, AND INTERNET"
2 Disclaimer: The reader accepts all risks and responsibility for losses, damages, costs and other consequences resulting directly or indirectly from using this report or from reliance on any information, opinions, estimates and forecasts contained herein. The information contained herein has been obtained from sources believed to be reliable. 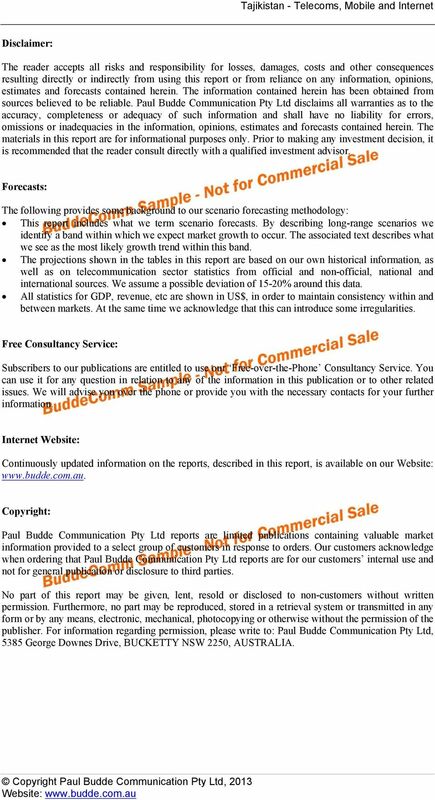 Paul Budde Communication Pty Ltd disclaims all warranties as to the accuracy, completeness or adequacy of such information and shall have no liability for errors, omissions or inadequacies in the information, opinions, estimates and forecasts contained herein. The materials in this report are for informational purposes only. Prior to making any investment decision, it is recommended that the reader consult directly with a qualified investment advisor. Forecasts: The following provides some background to our scenario forecasting methodology: This report includes what we term scenario forecasts. By describing long-range scenarios we identify a band within which we expect market growth to occur. The associated text describes what we see as the most likely growth trend within this band. The projections shown in the tables in this report are based on our own historical information, as well as on telecommunication sector statistics from official and non-official, national and international sources. We assume a possible deviation of 15-20% around this data. All statistics for GDP, revenue, etc are shown in US$, in order to maintain consistency within and between markets. At the same time we acknowledge that this can introduce some irregularities. Free Consultancy Service: Subscribers to our publications are entitled to use our Free-over-the-Phone Consultancy Service. You can use it for any question in relation to any of the information in this publication or to other related issues. We will advise you over the phone or provide you with the necessary contacts for your further information. Internet Website: Continuously updated information on the reports, described in this report, is available on our Website: Copyright: Paul Budde Communication Pty Ltd reports are limited publications containing valuable market information provided to a select group of customers in response to orders. 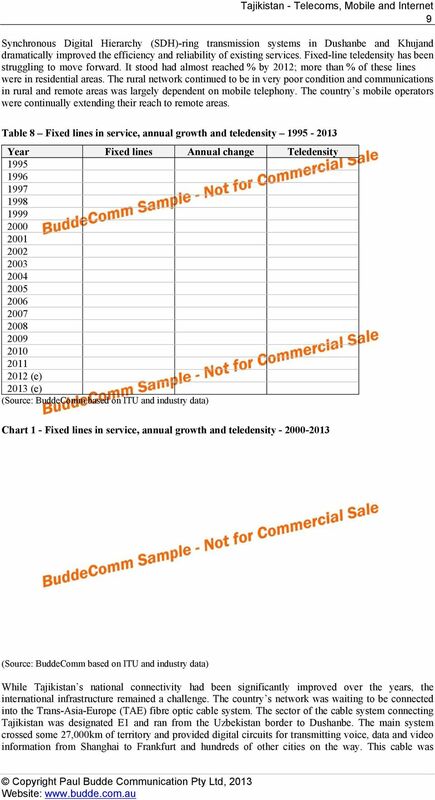 Our customers acknowledge when ordering that Paul Budde Communication Pty Ltd reports are for our customers internal use and not for general publication or disclosure to third parties. No part of this report may be given, lent, resold or disclosed to non-customers without written permission. Furthermore, no part may be reproduced, stored in a retrieval system or transmitted in any form or by any means, electronic, mechanical, photocopying or otherwise without the permission of the publisher. For information regarding permission, please write to: Paul Budde Communication Pty Ltd, 5385 George Downes Drive, BUCKETTY NSW 2250, AUSTRALIA. 6 13 documents relating to the IT sector. The SC monitors telecommunications, including the internet, for national security reasons. At the same time, the SC controls the implementation of the State Strategy on Information and Communication Technologies for Development of the Republic of Tajikistan Government control Tajikistan s constitutional law gives the president unprecedented authority over the media. At the same time the country does not have an official policy on internet filtering. However, state authorities have been known to restrict access to some websites at politically sensitive times by communicating their recommendations to ISPs. Prior to the 2006 presidential election, for example, the MOTC acting through the CRA issued a recommendation on filtering that advised ISPs that, for the purpose of information security, they should engage in filtering and block access to websites that aim to undermine the state policy in the sphere of information. According to the communication from the government, this decision had been taken in compliance with the national concept of information security developed in year It did not specify which websites the ministry wanted to block. However, one ISP, Eastera, was reported to have said that they had been asked to block access to [ [ [ [ and [ These websites were known for their frequent criticism of the government and its policies. Following the government action, users of major ISPs in Tajikistan, including Telecom Technology and Eastera, could not open these websites; however, Babilon users were continuing to browse the sites. In 2007, a media watchdog urged Tajikistan to relax the changes it had implemented to its criminal code that it believed could be used to restrict freedom of speech for people using the internet in the country. The Vienna-based Organization for Security and Cooperation in Europe (OSCE) said amendments signed into law by President Emomali Rakhmon could subject Tajikistanis to criminal prosecution simply for participating in certain online forums or chat groups. There was particular concern about amendments that singled out intentional distribution via the internet of knowingly false, libellous and insulting information, as well as expletive words and phrases which denigrate the dignity of human personality. The watchdog said that under this law, any factual mistake or strong opinion published, republished, reported or discussed on the internet can be penalised. It could also be interpreted to criminalise not only online debates or discussions, but even obtaining objectionable information via , a personal website, an online journal or a news portal. 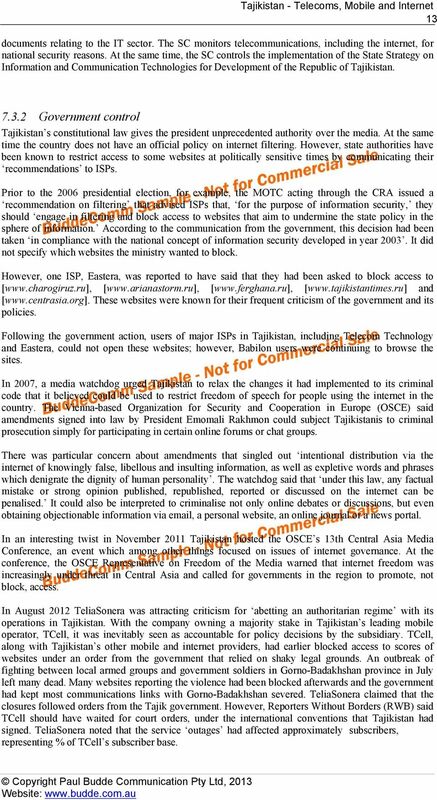 In an interesting twist in November 2011 Tajikistan hosted the OSCE s 13th Central Asia Media Conference, an event which among other things focused on issues of internet governance. At the conference, the OSCE Representative on Freedom of the Media warned that internet freedom was increasingly under threat in Central Asia and called for governments in the region to promote, not block, access. In August 2012 TeliaSonera was attracting criticism for abetting an authoritarian regime with its operations in Tajikistan. With the company owning a majority stake in Tajikistan s leading mobile operator, TCell, it was inevitably seen as accountable for policy decisions by the subsidiary. TCell, along with Tajikistan s other mobile and internet providers, had earlier blocked access to scores of websites under an order from the government that relied on shaky legal grounds. An outbreak of fighting between local armed groups and government soldiers in Gorno-Badakhshan province in July left many dead. Many websites reporting the violence had been blocked afterwards and the government had kept most communications links with Gorno-Badakhshan severed. TeliaSonera claimed that the closures followed orders from the Tajik government. However, Reporters Without Borders (RWB) said TCell should have waited for court orders, under the international conventions that Tajikistan had signed. TeliaSonera noted that the service outages had affected approximately subscribers, representing % of TCell s subscriber base. 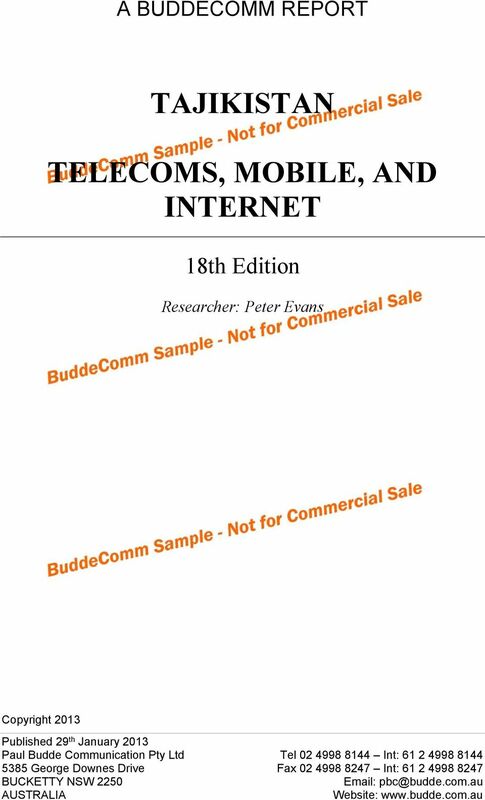 7 18 9 MAJOR MOBILE OPERATORS 9.1 BABILON MOBILE Tajik-American Joint-Stock Public Corporation, Babilon Mobile began operating a trial GSM 900 mobile service in 2002, followed by full commercial launch in Dushanbe and Khujand early in the following year. It went on to become the largest mobile operator in Tajikistan and held around % market share by (It lost the top-ranked position to combined market share of Indigo and Somoncom which was running at around % by 2009.) By 2012 Indigo-Somoncom had lost the lead to Babilon which had between % and % market share by that stage. In 2005 Babilon launched the first network in the Central Asian region, enabling the provision of a full range of services including voice and data transfer: General Packet Radio Service (GPRS), Wireless Application Protocol (WAP), Multimedia Messaging Services (MMS), international roaming and various other services. Based on Huawei Technologies solutions, the 3G network initially provided coverage of Dushanbe, but was subsequently expanded to other regions of the country. commenced discussions on the acquisition of a majority stake in Babilon in. The mobile operator confirmed talks were ongoing. 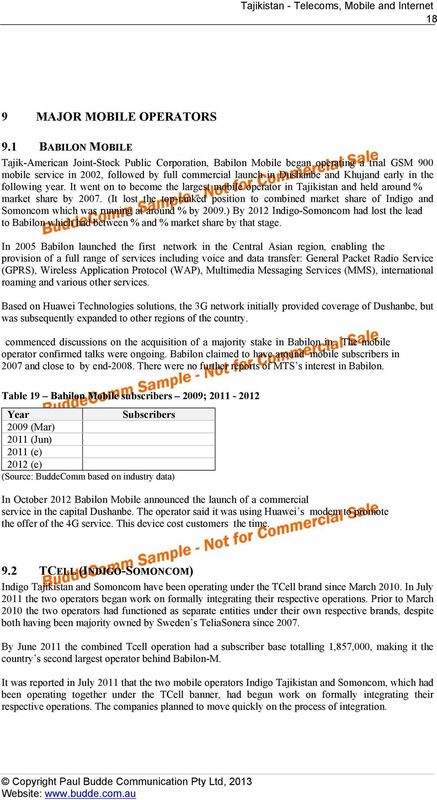 Babilon claimed to have around mobile subscribers in 2007 and close to by end There were no further reports of MTS s interest in Babilon. 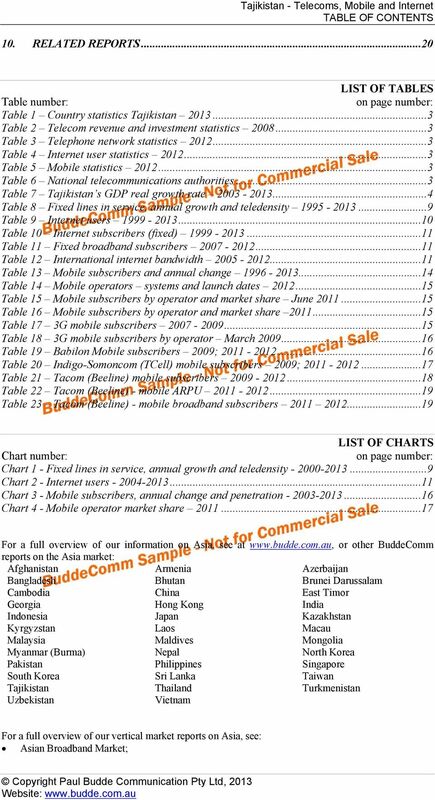 Table 19 Babilon Mobile subscribers 2009; Year Subscribers 2009 (Mar) 2011 (Jun) 2011 (e) 2012 (e) (Source: BuddeComm based on industry data) In October 2012 Babilon Mobile announced the launch of a commercial service in the capital Dushanbe. The operator said it was using Huawei s modem to promote the offer of the 4G service. This device cost customers the time. 9.2 TCELL (INDIGO-SOMONCOM) Indigo Tajikistan and Somoncom have been operating under the TCell brand since March In July 2011 the two operators began work on formally integrating their respective operations. Prior to March 2010 the two operators had functioned as separate entities under their own respective brands, despite both having been majority owned by Sweden s TeliaSonera since By June 2011 the combined Tcell operation had a subscriber base totalling 1,857,000, making it the country s second largest operator behind Babilon-M. It was reported in July 2011 that the two mobile operators Indigo Tajikistan and Somoncom, which had been operating together under the TCell banner, had begun work on formally integrating their respective operations. The companies planned to move quickly on the process of integration. Dow Jones Asia/Pacific Total Stock Market Indices Dow Jones Asia/Pacific Total Stock Market Index Stated Objective To provide a comprehensive measure of equity securities traded in the Asia/Pacific region. The primary reporting segmentation for VimpelCom will be structured following these geographical Business Units.